Back in Africa, erecting the Fire Pole Manse had been put on hold for a few hours while Charles finished cleaning up the sands (which had been easy enough and had left him plentifully supplied) – but he needed to decide what sort of new manse to put there to make sure that the place wasn’t used as a bridgehead again! He’d already provided water and made traditional life a lot more comfortable and reliable…. Maybe something for animals? He consulted the local gods! The boar-goddess advocated for the animal idea, especially if it bolstered her children! The god of the delta, of course, wanted more water. Several of the patrons of the local tribal groups chimed in with requests for another redoubt against intrusion. Well… a pocket-dimension place then! Assorted animal sanctuaries, and some areas for local villagers to take refuge in, with the support and population-control functions. The quasi-Yu-Shan bits too; the local gods would enjoy those! The local gods had to admit, this was the most attention anyone had paid to them in a while – and they knew ambrosia when they saw it. On the other hand, Charles HAD more-or-less told the delta god that he was here on a philanthropic mission. They were assuming that he was an eccentric and powerful, if ultimately benevolent, Celestial god. Still, with the major local gods now occupied, that left Charles looking for some Terrestrials to look after his forthcoming Fire Pole Manse! It seemed that the local Terrestrial Clan – the Kgathi – was fire-aspected, and was very much determined to keep the instability endemic to many African nations out of their own – and very, very insular, the better to keep foreign Terrestrial interests guessing. The local gods… were a little mixed on whether or not they’d make satisfactory caretakers and power-distributors; for Terrestrial Exalted, they were very respectful of the gods and elementals, and had rarely strong-armed them. On the other hand, they came down really hard on anyone who got overly friendly with foreigners. Representatives of Waters of Change, the city-father of Gaborone, said that sure, they’d let the power flow freely – but if they could find some way to use it to benefit mostly themselves and the local area, they would. Well, he’d have to include some remote-transmission links to get it to the power grids on the various continents anyway… Might as well go talk to them! 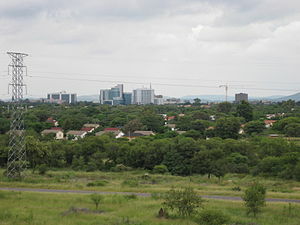 Gaborone was the largest city in the country, one of the fastest-growing in the world, and set between two hills – and a bit problematic! HE was a foreigner too, and so the local Terrestrials – and the people and spirits they dealt with – were unlikely to be all that cooperative. It turned out to be even worse than he’d thought… the Kgathi pretty well had a monopoly on the local occult interests! Fortunately, Charles got really lucky (nine successes on nine dice). Dealing with the local traditional religious and medical practitioners (who were SERIOUSLY wondering where his parents were! Botswana was pretty safe compared to many places, but still), he was eventually able to convince them that he wasn’t just some overly curious kid from the First World. It helped that the enlightened ones could see that his Essence signature was powerful and very mixed. Charles handled a few things elsewhere – mostly with Aikiko – in that time, but was soon back to wandering around Gaborone at random, repairing and improving things, and installing a couple of small demesnes and manses to add helpful conveniences… The business district DEFINITELY needed some attention! It seemed to have several stalled construction projects and to have been under construction since the city was founded… It definitely needed fixing! Repairs, patching foundations, completing things… He was subtle enough about it to keep the general population from seeing much – but anyone watching closely would easily note that the area was being fixed up. That did not escape the attention of the Kgathi. By the end of the first day of repairs, he was being watched through thaumaturgic means. By the end of the second, he was being watched by normal humans. By the third… well, there’s someone waiting for him when he appeared in the business district. The Essence signature would be well-hidden to most, but she was definitely a Fire signature to Charles’ senses. This young woman, was dressed normally, if a bit modestly and conservatively, for the region. On the way in there was much curiosity from the younger family members; it was clearly rare to have a Westerner in the manse, much less one so young! Sumaiyah waved them off with some irritation. He… really didn’t seem like the type for that though. He handed her a Sigil of the Dawning Age – which Sumaiyah examined quite carefully before handing it to one of the kids (who would have a lot of fun with it). It had looked like that box held a couple of hundred! Just what was she dealing with here? To talk of using such power, TRIVIALLY! Sumaiyah sent a few hasty telepathic queries… and found out that twelve terawatts was about five times the total electrical power output of the entire world! The world as a whole only used about 16 terawatts of energy in every form even before conversion losses! She had to get Charles in to talk with her father that day – even if he was playing a big prank, it would be entertaining. And if he wasn’t… that much power, in Africa… it could turn things around for the entire CONTINENT. Her father’s office was rather extensively fireproofed – and the man himself… well, sub-Saharan Africans were usually dark, but behind the illusions, his skin was more obsidian than flesh, and he could easily feel the heat from twenty feet away. Still, that was no problem! He extended a hand; even through the adaptation, it was rather hot. Charles shook it anyway of course; he did have very good armor. It was uncomfortable and stung a bit anyway? Ah! A bit of essence-based character-testing! And a very firm handshake! Charles’s conviction roll got seven successes, thanks to his cult, the Constitutional Charm series, and a good dose of luck. Surely there had to be some catch… he’d dealt with great powers before and knew that there was ALWAYS a catch. That had been the other major reason for his surveying around the city. It might be a minor issue though! The absolute best place was where Parliament currently was; on a modest demesne that subtly encouraged honesty in thought and actions – probably why someone clever had put it there! Yu-Shan? Well, that most likely said “Celestial God”… but THIS AFTERNOON? What in the blazes? Tshosa maintained his composure, but only by so much! Well… that lent more credence to “This Afternoon”! The “boy” must have manses as part of his domain, plenty of resources (“Salary”), and that divine charm that completed tasks instantly. And… he’d want to use it as much as possible, so as to expand his domain. No wonder he wasn’t asking for much! Simply creating a manse was a direct profit for him! Charles was rather pleased! The word must really be spreading – although it was a bit of a jump to link it to him. Logic pointed that way of course, but few people were really sure! Tshosa knew it was a bit of a jump – but the language in the advertisements sounded a LOT like Charles in the reports he’d seen and from what he’d seen so far! Besides… Charles had just announced his intention to create a gateway manse to supply the human race with power. More gateway manses to supply living space… was a pretty obvious next step! Charles was happy to list them off! There would be three relatively nearby, a circle of six over in egypt, and eighty more scattered across Africa. After all, with seventy-two planets being opened up, and a dozen gates back to Earth each, most continents were getting quite a few! Well, except for Australia. Most of the interior was so heavily tangled up with the Dreamtime realm, that you never knew where a gate would be emerging today – and so almost all of theirs would be relatively near the coast! He wanted it relatively evenly distributed – but there’d be plenty; after all, the entire world didn’t use anywhere near that much electricity – even if it did use somewhat more energy in various forms (actually less, but then such a lot of the worlds 16 Terawatts was lost as waste heat…). The Kgathi were certainly welcome to plenty of it for the local grid! Tshosa was a stiff negotiator; while Botswana was pretty well off for the region, he knew full well that it could not compare to the major nations. He was rather startled at how accommodating Charles was. Oops! A direct question! That was awkward! (Charles) “Well, I really can’t say what – but the universe needs a lot of fixing, and somebody has to do it! Yep. There it was. Possible problem -> build another manse. That said a lot about the child right there. The Parliament Building was modest by Western standards, but radiated the hidden-to-mortals energies of the demesne. Mr. Kgathi was quite proud of the place! It had involved a lot of hard work, and many cover identities, to convince them to build there, but he had never regretted it! Several important looking folks nodded to Tshosa as they headed to the geomantic center, which was… an isolated alcove. He took a look at Charles with his Essence senses… and a rather potent Air Charm! He threw in a more detailed description… that matched very closely. (Tshosa, distantly, and MUCH more seriously than before.) “A long time ago… long before you were born, I’d say. Tell him to give the Starbreaking a bloody nose for me, would you? So trusting… so very trusting! The boy was handing him global influence, and enough raw power to change the destiny of all of Africa – not to mention a Hearthstone that could channel electrical energy from the manse to power pretty much any nearby device – on the basis of some quick recommendations and a brief acquaintance. The things he could – and was planning to – do with that power! For a mere starting item, once the Terrestrial cover was irretrievably blown, he would ensure that Botswana was no longer dependent on other nations for energy! And he… ate it. There was a bit of Wood Essence leaking from him; the stone was now attuned and in his stomach, where it would stay! Charles wasn’t actually very worried; the power-distribution and essence-channeling was the main function, and THAT was only adjustable within limits; everyone would get a decent share! Still, it will be a very VERY handy resource for them! And Charles headed for his next stop… at least that completed the set of elemental-pole manses, and would rapidly bring the Dragon Lines up to full strength again! Uh-oh! He’d been so distracted by Charles wanting to give HIM a manse of immense power that he’d dismissed a few obviously mass-produced charms – but the boy had built that manse in MINUTES. For all he knew the boy had given the kids some fairly impressive artifacts! The Sigils of the Dawning Age weren’t actually all THAT powerful, and wouldn’t work for an Exalt – but as gifts to children they were more than a bit overboard! Even if they WOULD greatly reduce the jealousy towards the ones who actually did Exalt… Was that a part of the point?